Live In-Play sports bets are currently the hottest way to place Bitcoin sports bets. If you want to get a slice of the action no matter how far into an event it is, then you need to place In-Play bets. With In-Play bets, you can opt to bet at the beginning, middle or end of a match and still be a winner. We understand that some of you Bitcoin sports bettors might not be up to scratch on just what In-Play sports betting is, so this guide is very much for you. Let’s answer some of the most commonly asked questions regarding this sports betting phenomenon. In-Play sports betting is a type of sports bet that is made after a sporting event has already begun, and can be made right up to the moment that the match or game has ended. For instance, if you were going to place a bet on a football game or a Formula One race, you could do so in the sixtieth minute, or ten laps before the end of the race, respectively. The clue is in the title. It is called In-Play, because the sporting event is in session when you bet. Are there any perks to it? We can think of one! The biggest perk to betting with In-Play bets, is that you can make an educated bet on how the remainder of an event is going to turn out. If you’re late to the party, you can already see how a match, race or game has begun, and are therefore in a better position to decide who will win. Naturally, the odds are going to shift to be so small that you might not make anything on it if you bet for whomever or whatever team is in front. However, if you think the underdog can still achieve victory, the odds will be huge, hence a sizeable pay-out. Are all sporting events available for In-Play bets? No. Normally, Bitcoin betting sites will have an entirely separate section of their website devoted to live In-Play sports bets. If they do not, then sports bets will quite clearly say whether they are In-Play or not. Generally speaking, most of the major events can host In-Play bets if the Bitcoin betting site supports them, but certainly not all events will be In-Play betting matches. Should I watch the event when making In-Play bets? Absolutely. If you are going to be placing a bet on an In-Play sporting event, surely you will want to know what the score is, or what the situation in the game currently is, before you make your bet. If you don’t, then you might as well make your bet before the game, match or race commences. 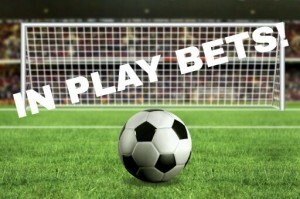 Most of us place In-Play bets whilst watching the game on our televisions or in the pub. Some of us even make bets whilst at the stadiums and arenas watching the game. However, if you can do neither of those, then most major Bitcoin betting sites will offer live coverage or text commentary of their In-Play sporting events from their websites. As a general rule, if you are going to be placing In-Play sports bets, you should always be keeping an eye on the event itself. Can I cash out at any time? That really depends on two things: the Bitcoin betting site, and the type of event. Some Bitcoin betting sites will permit early cash-outs if your team is in front. Others won’t. It takes a lot of guts to cash out early, so ask yourself are you sure you want to do that? On the other hand, some sites will permit early cash-outs via special offers on some of the most popular sporting bets. Just because a site is offering live In-Play bets, doesn’t mean that you will get to cash out early, though. CloudBet is one of the best places for you to place Bitcoin sporting bets, especially live In-Play ones. They run an entirely separate section of their sports betting site, and this section deals entirely with In-Play sporting bets. You can keep an eye on your game, and make bets based on what is happening in the event with CloudBet. Most importantly, this Bitcoin betting site also carries a host of offers and deals tied to sporting events, and there are many of those which you can bet on. Nobody should go wrong when making In-Play bets with CloudBet.